1. Fish Creek Falls: You can spend just an hour, several hours or all day at this 283-foot waterfall with 7.6 miles of hiking trails. The trailhead is accessible to wheelchairs and strollers. Within a few minutes walk the beautiful cascading falls come within view. There are a few overlook areas, several picnic tables and lots of butterflies – as we discovered. Hike down to the bottom and explore the slippery rocks as the cool water rushes over your feet or hike to the top of the Falls for a different type of rush. Just a few miles from downtown, parking at the Falls is just $5 for the day. 2. Gondola ride: The ride up Mt. Werner is always fun for the kids. And adults will enjoy the magnificent scenery. Once at the top, have lunch at the Oasis Sun Deck and take in the panoramic views. Then, choose to either ride back down on the gondola or hike or bike down. Catch the gondola at the base in Gondola Square. 3. Coca-Cola Adventure Zone: This was my kid’s favorite part of our trip. The Adventure Zone is located in Gondola Square, where all the mountain snow run-off has formed the perfect splash area for the kids. 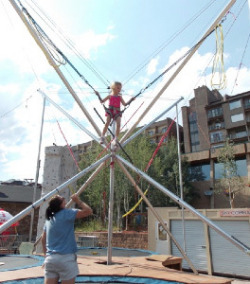 Buy some tickets at $3/each to jump in the bouncy house, on the bungee trampoline, climb the climbing wall or ropes course, spin in the human gyro ball or spin your own spin-art t-shirt! 4. 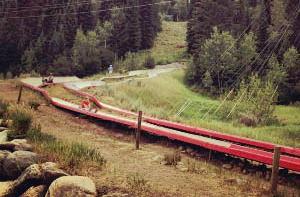 Alpine Slide – The Howler: So much fun from the ski lift to the top of the mountain to screaming back down 2,400 feet of track in a sled. Located on Howelsen Hill right downtown. 1-4 rides are $10 per person, children aged 2-6 can ride with a parent for just $5 more. 5. Old Town Hot Springs: This community center in the middle of downtown is where all ages come to play. 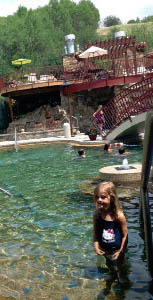 There are several hot spring mineral pools in addition to a fitness center and tennis courts. The kiddie pool has lots of fun climbing features and a spray ground, there are two water slides and a rock climbing wall for the older kids and just relaxing areas for us really big kids. 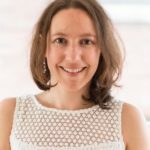 Pricing ranges from $7 to $20 with kids under 3 free. 6. 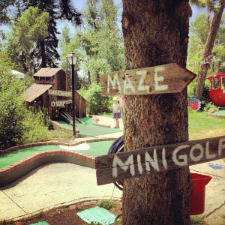 Amaze’n Steamboat Family Fun Park: Unlike any fun park I’ve ever been to, Amaze’n is appropriately named for the giant maze it took us over 20 minutes to find our way out of. Do it in under 8 minutes and you’re entered into a drawing for a Kindle! You can even play laser tag while competing against your friends to exit the maze first. Where else can you find miniature golf, a bungee trampoline, gemstone panning, water-walking balls (I promised our daughter we’d come back to do this) and more? Also downtown, prices range for each activity or buy a day pass for $27.